Actually, it looks like he has an afro hairdo, and it’s morphed into a brain. Just noticed the label at the bottom. It seems this image depicts the mind of the city of St Paul. Not somewhere I’d care to live! Looks better than those hats Beatrice and Eugenie wore. Keep the One-Eyed Octopidistra Flying! I’m trying to figure out which library this is from, but it’s just not coming to me. It’s on the plastic overlay over the dust jacket, the Saint Paul (Minnesota) Public Library. Publishers back in the ’70s — and maybe still, I don’t know — produced hardcover science fiction and young adult books for libraries that I never saw anywhere else. Maybe they were special printings? Anyway, they often seemed to have this sort of cover illustration, kind of selfconsciously arty-literary. Please let me know when you have returned this book to the library, I want to check it out next. Oh, and octopidistra is my new favorite word. I’m still not certain if the title of the book is “The Mind of the City – St. Paul Library”, or “The Best of C.M. Kornbluth”, or simply “Kornbluth” and C.M. is the author’s initials. That shirt must come from the same place The Hulk gets his pants. @drlemaster: I will try to hurry it back in anticipation of enormous demand due to GSS publicity. Memo to me: A Best of Good Show Sir library display. @Anti-Sceptic: The yellow strip on the bottom is a label we used to brand books with back in the day. Patrons complained at some point that all the labels made the books look fugly, so we stopped. I’m also sad that this magnificent cover is marred by a barcode, but what can you do? Listen, there is NO way this can be the BEST of C.M. 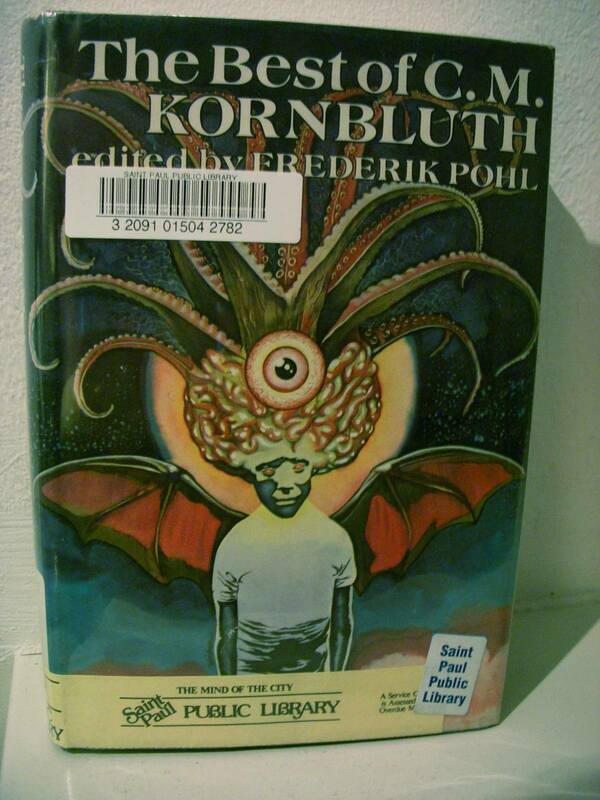 Kornbluth unless it includes that one story about the kid with bat wings whose oversized brain was eaten by a one-eyed squid while he was trying to reach the giant slice of cantaloupe. @Mefista: That’s what I thought – this looks seriously Lovecraft to me. But, seriously – LSD STRIKES AGAIN!